Now we are back home again after an 11,300 km trek, mostly across Western Australia. 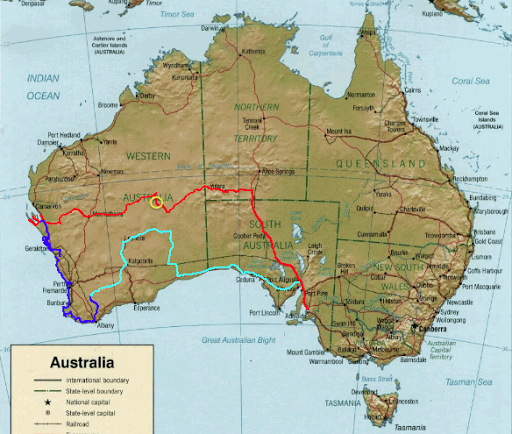 Adelaide to Uluru, then south west on the Great Central Road, north up the Hunt Oil Road, and due west on the Gunbarrel Highway, all the way out to Steep Point on Shark Bay, the most westerly point on the Australian mainland. 4,700 km north and west on the Red track on the map, click here. Debogging our Oka after getting stuck for a day on the Hunt Oil Road. 0 km achieved that day, in the Yellow circle on the map. 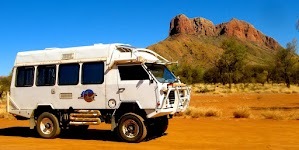 Not a good place to get bogged, it doesn’t get much more remote than this, click here. Southwards from Shark Bay to Perth and the south west corner of WA. 3,000 km south on the Blue track on the map, click here. Central WA sort of eastwards back to Adelaide, along the Anne Beadell, Connie Sue and Old Eyre Highways. 3,600 km east on the Green track on the map, click here. 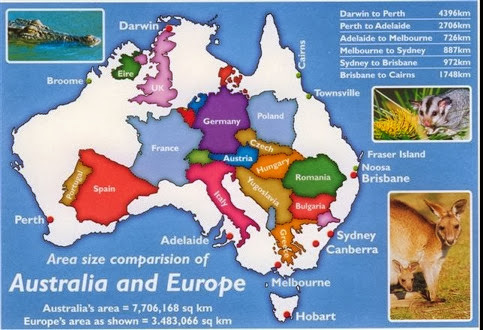 Just for fun, as an indication of how far we travel on our trips, here’s a comparison of the relative sizes of Australia and Western Europe.